New federal guidelines requiring healthier school lunches have made headlines in recent years, but that doesn't mean kids are eating them up. 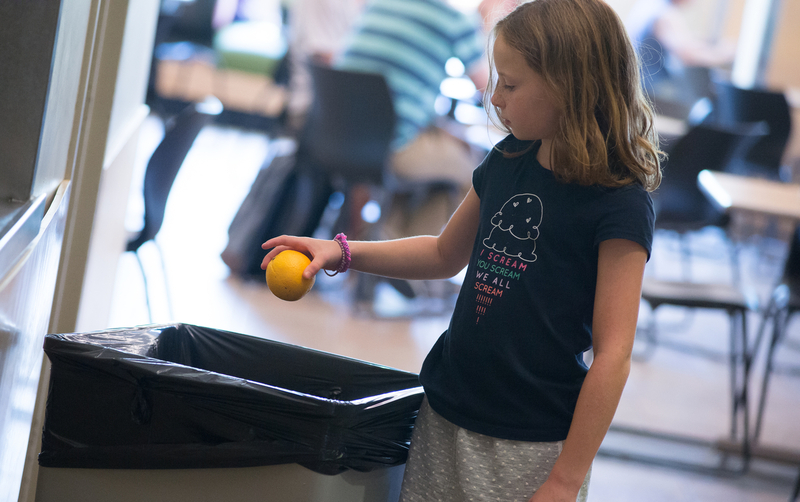 In fact, a study conducted soon after the Healthy, Hunger-Free Kids Act went into effect found what many parents suspected: a lot of school children were taking the required fruits and vegetables and throwing them directly into the trash. The small study, published online Tuesday in Public Health Reports, comes about a month before Congress is scheduled to vote on whether to reauthorize the program. Researchers from the University of Vermont used digital photography to capture images of students' lunch trays after they selected their food, as they were leaving the lunch line, and again at the end of their lunch as they passed the food disposal area. They found that while children placed more fruits and vegetables on their trays - as required by the USDA mandates put in place in 2012 - they consumed fewer of them. The amount of food wasted increased by 56 percent, the researchers found. "We saw this as a great opportunity to access the policy change and ask a really important question, which was, 'Does requiring a child to select a fruit or vegetable under the updated national school lunch program guidelines that came into effect in 2012 correspond with increased fruit and vegetable consumption?'" lead study author Sarah Amin told CBS News. "The answer was clearly no." Amin and her team documented hundreds of tray observations over 21 visits to two elementary schools in the Northeast both before and shortly after the implementation of the USDA guidelines. About half of the students at the schools qualified for free or reduced price lunch, a marker for low socioeconomic status. This isn't the first study to look at fruit and vegetable consumption in school children after the federal guidelines passed. A 2014 study from the Harvard School of Public Health found the opposite result - that kids actually ate more fruits and vegetables after the new standards were put into place. Amin said that although the sample of two schools in the current study is small, the results correspond to anecdotal information from school nutrition directors and other school officials about kids' responses to the school meal regulations. "We used rigorous, validated dietary assessment methods," she said. "That's what really bolsters our confidence in these findings. They may not be generalizable across the country. There might be different patterns depending on different sociodemographic characteristics, but for the schools we collected data on and in that time period using these methods, we're confident in our findings." But the USDA says the school lunch guidelines are making a positive difference in children's health. "The facts are clear: kids are eating healthier as a result of updated nutrition standards for school meals, 95 percent of schools are successfully serving healthier meals and in 2014, schools saw a net nationwide increase in revenue from school lunches of approximately $450 million," the USDA said in a statement. The agency also noted a 2015 study from the University of California, Berkeley's School of Public Health, which found that nearly 90 percent of students surveyed liked at least some school meal options. The authors of the latest study suggest that schools can take steps to make fruits and vegetables more enticing to children, such as slicing them rather than serving them whole, offering them with dips and incorporating them into other parts of the meal. "It goes back to making it easier for kids to eat fruits and vegetables and making them more appealing to consume," Amin said. Other strategies, such as taste tests, school vegetable gardens and Farm-to-School programs can encourage fruit and vegetable consumption among school children in addition to what the cafeteria provides, she said. Finally, Amin pointed out that once schools fully acclimate to the guidelines, she thinks overall consumption will increase, especially for those students who entered school as kindergarteners under the new guidelines in 2012 and know no other way. "The overall goal of these guidelines is to improve children's dietary behaviors and ultimately address the childhood obesity epidemic, and so there needs to be patience to allow children time to adjust," she said. "Change takes time. This really rocks the school nutrition world. We have to have patience with this and not give up hope yet." Editor's note: This story has been updated with corrected data from the researchers indicating food waste increased 56 percent; and reaction to the study from the USDA.